BOOTH LOCATION CAN BE REQUESTED BUT NOT GUARANTEED. 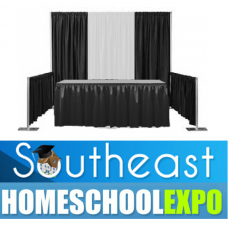 2019 SOUTHEAST HOMESCHOOL EXPO - JULY 26-27, 2019! This contract for exhibit space is extended for the purchase of exhibit space and shall be provide by Southeast Homeschool Expo, LLC in accordance with the conditions and regulations governing the exhibits of the conference. By submitting this application/contract, you agree to all conditions and regulations listed below. Information from this application/contract will appear in the Southeast Homeschool Expo Directory EXACTLY as it is listed on this application/registration/purchase. This includes Exhibitor/Company Name, Published Phone, and URL. PAYMENTS BY CHECK MUST BE RECEIVED WITHIN 10 DAYS OR EXHIBITOR REGISTRATION WILL BE VOIDED AND EXHIBITOR AND WORKSHOPS WILL BE REMOVED. NOTE: Each exhibit booth is 10’ X 10’ and comes with a draped and skirted 6 foot convention table, one chair, a wastebasket, 8’ back drape, and 3’ side drape. 1. Application must be accompanied by check for total price for booth space(s). Please make check payable to Southeast Homeschool Expo, LLC. No booths will be reserved without payment. 2. Exhibitor Booth Cancellation / Refund Policy – Exhibitor shall have the right to cancel booth space agreement at any time by written (sent via US MAIL to 215 Hembree Park Drive Suite 150, Roswell GA 30076) notice to Southeast Homeschool Expo, LLC. In the event of such cancellation received up to 60 calendar days prior to Expo, Southeast Homeschool Expo, LLC shall refund booth space fee minus a $100 cancellation fee. No refunds will be made on cancellations received within 60 calendar days prior to Expo. Under all circumstances, Southeast Homeschool Expo, LLC retains the right to resell any booth space canceled by exhibitor. 3. Southeast Homeschool Expo, LLC reserves the right to refuse acceptance of any application if the products to be displayed are deemed unsuitable for the purposes of Southeast Homeschool Expo, LLC. Final decisions will be made by the Executive Board. If application is not accepted by Southeast Homeschool Expo, LLC, all monies paid will be returned to applicant within 30 days of notification. 4. The Exhibitor agrees that in the event he/she fails to install his/her product in the assigned space by 5 PM, Thursday, or fails to comply with the provisions of this agreement, Southeast Homeschool Expo, LLC shall have the right to take possession of said space and release or use that space without rebate to the Exhibitor. 5. It is mutually agreed that Southeast Homeschool Expo, LLC and the Cobb Galleria Centre shall not be liable to the Exhibitor, and said Exhibitor will hold harmless the aforementioned, for any loss or damage or injury to his/her property contained in such exhibit; or injuries to his/her person, his/her agents, employees or other persons, no matter how sustained, from fire, theft, accident or other causes. All claims for such loss, damage or injury are hereby expressly waived. 6. The Exhibitor agrees that Southeast Homeschool Expo, LLC shall have the right to make rules and regulations for said exhibition as it shall deem necessary and to amend same from time to time. 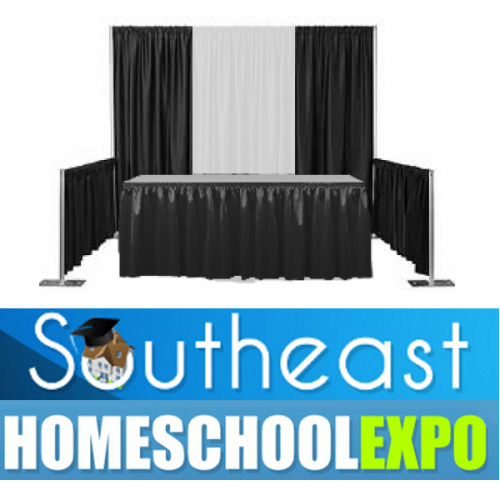 Southeast Homeschool Expo, LLC shall have the final determination and enforcement of all rules and regulations. 7. Exhibit space shall be available for setup on Thursday as noted in brochure. Teardown will be ONLY on Saturday evening. Teardown any other time during the show is strictly prohibited. 8. All exhibited products must be confined to the limits of the booths assigned. Aisle space must be left entirely free for traffic. All exhibitors utilizing cooking equipment must have at least one ABC fire extinguisher in the booth during the entire show. No open flame (gas) cooking is permitted in the Galleria Centre by the order of the Fire Marshall. 9. Exhibitor agrees to have assigned booth space open and operated at all times during show hours. 10. No food or beverage items may be sold in the exhibit area. Have you read and agree to Rules, Regulations, and Refund Policy for Exhibitors?